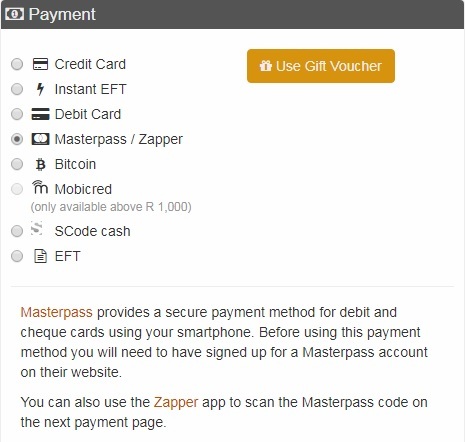 You can now use the Zapper App to make payments for your orders via Masterpass. You can scan the QR code using your Smartphone to easily make your payment. To learn more about Zapper please visit their website. To pay using your Zapper App please add the items you want to purchase to your cart and click on Checkout. Select the Masterpass/Zapper Option as below. After selecting your Address and Delivery Method click on Buy Now and then scan the resulting QR Code you'll receive on the next page into your Zapper App.